He is and ever shall be! St John of Kronstadt Church is an Orthodox Christian Church and is part of the Orthodox Church in America. We are located in Lincoln Nebraska at the corner of 28th and Holdredge Streets. We look forward to seeing you! *Healing services are offered the last Wednesday of the month at 6:30PM. All are welcome. This is a non-sacramental service of prayer and anointing with oil for the healing of soul and body. This is a great opportunity to share and experience the Orthodox Church with family and friends. "Is any sick among you? let him call for the elders of the church; and let them pray over him, anointing him with oil in the name of the Lord"
The Divine Liturgy is offered on Sundays and on Feast days. The service consists of readings and Psalms, a Gospel and sermon, and culminates with our partaking of the Holy Eucharist. Vespers services are offered four times per week in the evening. Occasionally, we will hold Vigils which include Matins the night before Major feasts of the Church. The word "Matins" means morning prayers. 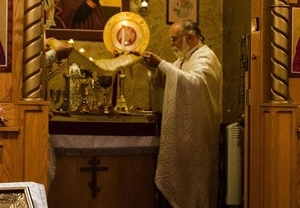 These services are offered before the Divine Liturgy and occasionally during the week. The life of the Orthodox Church and her members is best seen through the services of the Church. Our parish is blessed with the dedication of clergy, readers and members, allowing us to celebrate many of the daily services. The Divine Liturgy of St John Chrysostom and St Basil have been celebrated by the Orthodox church since the fourth century. Read more about it here. 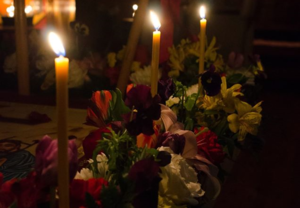 An Orthodox service is a rich and full experience with much to understand and appreciate. We welcome you to come and worship with us. The Orthodox Church practices the original ancient traditions through the liturgical cycle and divine mysteries or sacraments. There is a lot of information out there for anyone wanting to learn more about the Church. Check out our reading list, links, and suggested blogs!